Ishan Deshpande and his colleagues from the group of Susan Gasser and the Protein Structure Facility at the FMI elucidated the mechanism of how Mec1-Ddc2, a tumor suppressor involved in DNA damage response assembles at sites of DNA damage. They focus on the Ddc2-RPA interaction, which brings the Mec1-Ddc2 kinase complex to single-stranded DNA at sites of DNA damage. With their structural data, the FMI scientists provide the missing link between two previously published structures, allowing them to assemble a to-scale composite structural model of Mec1-Ddc2 on ssDNA-RPA at DNA damage sites. The ATR kinase has attracted interest for over 20 years. This kinase is one of two central DNA damage sensing kinases in mammalian cells, and it is also a tumor suppressor. Two compounds that inhibit ATR kinase are in clinical trials for the treatment of leukemia and solid tumors. 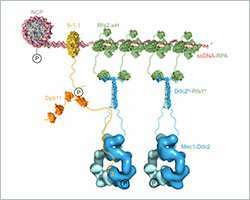 Yet, how this enzyme is regulated on a molecular level has remained elusive. Ishan Deshpande, a PhD student in the Protein structure facility and the group of Susan Gasser at the Friedrich Miescher Institute for Biomedical Research (FMI), has now elucidated the mechanism of how the yeast homolog of ATR, Mec1, assembles at sites of DNA damage for site-specific activation. In yeast, as in humans, Mec1 forms a complex with a regulatory subunit called Ddc2 (ATRIP in humans). Upon DNA damage, large stretches of single strand DNA (ssDNA) are exposed, which are rapidly covered by replication protein A (RPA). Mec1-Ddc2 recognizes these ssDNA-RPA stretches and accumulates at these sites to initiate repair mechanisms. Deshpande and colleagues have now resolved the 3-D structure of the Ddc2 N-terminus in association with part of RPA thus providing structural data on the link between RPA and Mec1, which had up to now been elusive. We obtained a high-resolution co-crystal structure of the Ddc2 N-terminus together with a subunit of RPA, Deshpande explained. With these data, we could show that Ddc2 forms homodimers and binds RPA by its N-terminus. Interestingly, our Ddc2-RPA structure is the missing link between two previously published structures, and this allows us to assemble a to-scale composite structural model of Mec1-Ddc2 on ssDNA-RPA at DNA damage sites. The Ddc2 N-terminus not only facilitates Mec1 interaction with RPA but also functions as a spacer for the Mec1 kinase. Deshpande explains: The elongated Ddc2 N-terminus allows the large Mec1 kinase module to move without encountering the damaged DNA nor the repair machinery working at the lesion. In addition, the Ddc2 spacer may allow Mec1 to phosphorylate multiple spatially distinct substrates while remaining bound to the site of DNA damage. You can think of the Ddc2 N-terminus as a giraffe's neck that allows the giraffe to reach the grass on the ground as well as the leaves on a tall tree. Proper Mec1-Ddc2 activity is important for all kinds of DNA damage repair. However, the functional data from Deshpande and colleagues indicate that the Ddc2 N-terminus is particularly important for cell survival after DNA damage by UV light. Our model suggests that the mere recruitment of Mec1-Ddc2 to ssDNA can contribute to its homodimerization and therefore activation of the Mec1-Ddc2 complex, explains Deshpande. In addition, Susan Gasser points out "that this has been a wonderful collaboration between my lab and the structure facility of the FMI, enabling us to bridge from structure to function."